When I was a kid, I loved to play with the Prell shampoo. The clear, emerald-green stuff came in a transparent tube. I adored the depth of that color. More than that, I loved the pocket of air. When I turned the tube upside down it would start rising slowly through the honey-thick goo, taking on the typical globular shape of a bubble—but with one difference: because the medium was so thick, its trailing edge was drawn out into a point, like a water drop just before it breaks free, only inverted. I also remember staring into my dad's beer glass, transfixed by those little strings of bubbles that appeared out of nowhere and danced around through the amber. I'm still fascinated. Is there any one of Nature's little wonders more sublime than a bubble? Think of the soapy kind kids blow with those little plastic wands. Like sheer 3-D kaleidoscopes, their colors shimmer and flow. And have you ever made a really big bubble hoop out of rope or a coat hanger? Once you figure out how to get the right amount and rate of air to balloon the soapy film without breaking it, you can produce bubbles so big they undulate as they drift away, writhing to find their roundness. ...you can produce bubbles so big they undulate as they drift away, writhing to find their roundness. Not all bubbles are so whimsical; just ask divers. If they ascend too fast, the nitrogen dissolved in their blood can bubble up just like the carbon dioxide in a quickly uncapped bottle of soda. I'm visited by an uncomfortable little bubble every once in a while. I don't know where it comes from, but it feels like a tiny holdout from a burp, a bubble that finds its way into some little nook in my chest, where it presses on something that doesn't appreciate it. It used to scare me—I thought I was having a heart attack—but now I just wait until it eventually finds its way out the way it was headed in the first place. Think of all the bubbles we just take for granted. 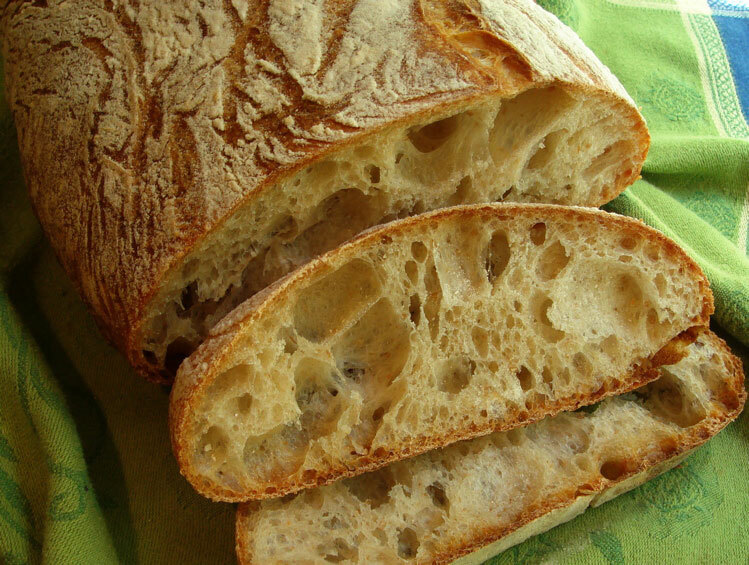 Bread—yes, how do you think it gets that texture? Foam rubber. A wine glass. Rice Crispies. There are even bubbles so small we can't see them. Paints and plastics, as well as lots of other materials, contain millions of microscopic glass bubbles added to extend volume, reduce weight, add strength, resist abrasion and improve flow quality. 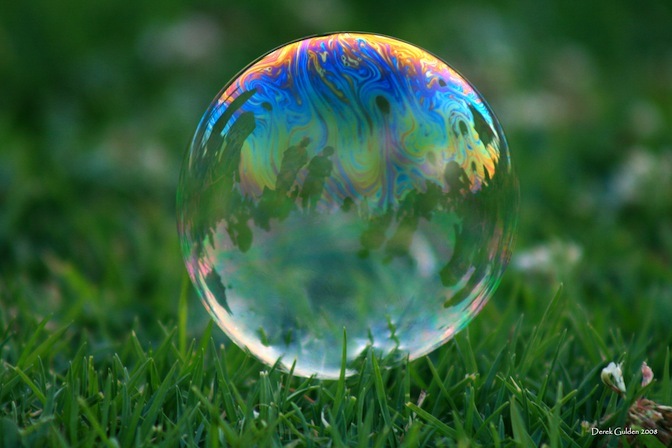 Bubbles are used in inkjet printing, mining, environmental engineering, medicine, oil production, food science and any number of other industries. Bubbles have a sneaky side too. Nestle knew it back in 1938 when they figured out a way to provide less actual chocolate in their bars than it appeared by adding puffed crisps—essentially bubbles—to the mix. And now, alas, Hershey has pulled an even more devious trick with their Air Delight chocolate bar, somehow making it sound like you're getting more, not less. 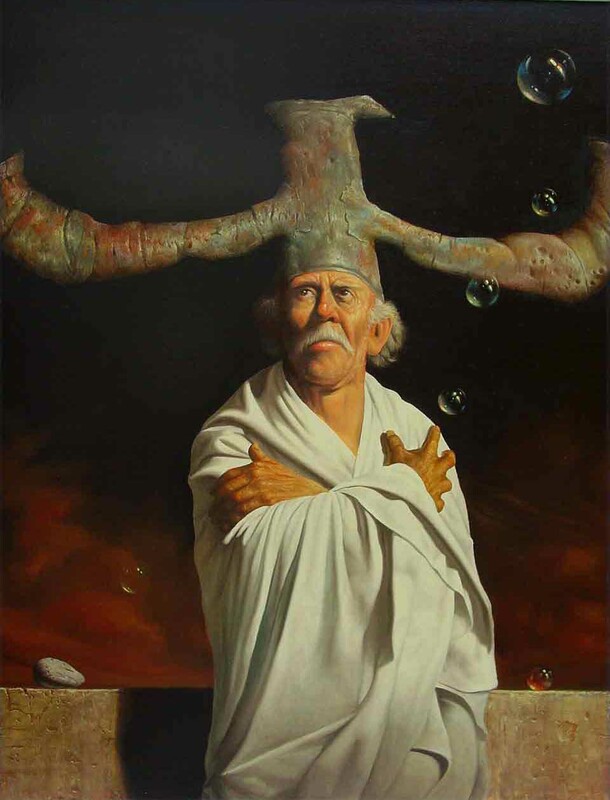 My friend, the fine contemporary Mexican painter, Fernando Garrido, uses bubbles as a sort of signature element in his eccentric, magical-realist portrayals of warriors, sages, alchemists, oracles and mystics. The bubbles emerge, in astounding, dripping detail, from the characters’ mouths, through vents in their outlandish headdresses, and sometimes, like those little beer bubbles, from no apparent source. Catching reflections of neon lights or an always-unseen sun, they float through Garrido's scenes, reminding us of the tenuous balance between life's shimmering fullness and its utter impermanence. How and where do you see bubbles? "A soap bubble is the most beautiful, most exquisite thing in nature. I wonder how much it would cost to buy a soap bubble, if there were only one in the world?" Oh, I remember the Prell shampoo bubbles and also that we used to meke elaborate hairdos in the tub using Prell. Thanks for a lovely post and the trip into my childhood! Hi Jean - Thanks for your comment! I'm glad I could deliver a blast from the past. Isn't it fun to share moments of common memory? When you think about it, Nature (in this case with a little help) provides an endless variety of amusements and toys...and not a one of them digital! The world is our bubble, and perhaps it gets pricked every now and again to let out some of the pressures it builds up. In a sense, every ecosystem or container is an energetic bubble which operates then under subtle tensions.... therefore, anything created... including a universe floats around in a vacuum of space where its occupants have the fun of creating a balance under pressure... or not.... to see what new formations from within may come from it..... Therefore, electro magnetic tensions stretch and pull and push the bubbles constantly through conscious and often unconscious intentions... Any directed energy therefore shifts the contents of the bubble... bringing new reflections from ever changing surface tensions to reflect and mirror upon. Thanks for your always fascinating reflections, Bernie! If the world is our bubble, do we exist inside or outside of it? Reason I ask is that, at times, I've felt the sense of both. Hey, Bernie -- thanks for your thoughtful comment. You always stretch my mind!